In the last few months I have been trying to find new companies for toys for my son since he has out grown his baby toys and for my nephews since they will no longer be in day care. In my search I found a really great company named ALEX Toys that makes toys, art supplies and so much more. We will be having a review and giveaway for the Moms Leaving the Workforce event coming very soon. I wanted to share with my readers a fun App for the iPhone or iTouch phones that will be released on Friday March 25th. You can download the App from the website alextoys.com on Friday the 25th. The app is for FREE, which is awesome! It is a fun game that focuses on emotions and building self confidence. I know for kids its hard to express their feeling sometimes. I think a game like this would even be a good conversation starter for your little ones. They also can learn about matching, colors and animals. 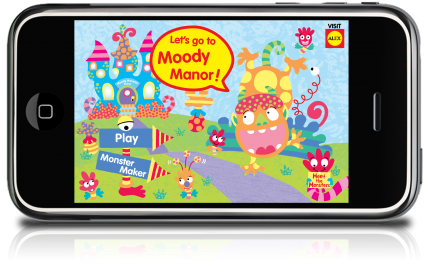 "ALEX®, the premier award-winning brand of creative toys and children’s lifestyle products, is delighted to announce the launch of its first app, Moody Monster Manor, on Friday, March 25. This free app for ages 3 to 6 years, features four fun and exciting monster-themed games that build self confidence as well as provide hours of fun! Visit the ALEX® website www.alextoys.com on March 25, for printable monster illustrations to color that accompany the app and enter a contest to win a monstrous prize of 10 ALEX® monster-themed toys including Diving Monster, Tub Target Screaming Monsters, Monster Bingo, Monster Clompers and Monster Mitts!" For the Launch of this new App The Coupon Queen Bee is hosting a giveaway for Tub Target Screaming Monsters Bath Toy. You can also print some fun coloring pages of the Moody Monsters here. 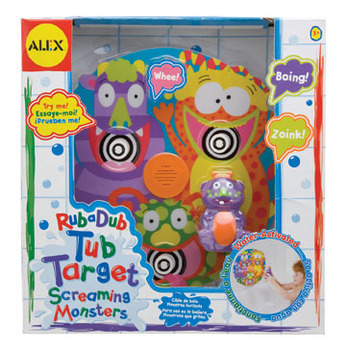 To Celebrate the Launch of Moody Monsters Free APP Alex Toys has generously offered one of our lucky readers the chance to win Tub Target Screaming Monsters. Mandatory entry is to Like Alex Toys in Facebook. -Download the Free APP of Moody Monster Manor on Friday March 25th and come back leaving a comment saying you did this. *Limited to US residents; 18 years old and above. Giveaway starts March 21 , 2011 and ends on April 1, 2011 at midnight PST. Winner will be emailed and has 48 hours to respond before another winner is selected. I was not paid for this giveaway or post. I was given the opportunity to host a giveaway on my blog. liked Alex Toys on facebook! This would be great this is how I am decorating my bathroom! I Like Alex Toys in Facebook. Like Alex Toys on FB. Also follow them on Twitter. And like you on FB. Like Alex Toys in Facebook. I like Alex Toys on Facebook! I follow Alex Toys on Twitter! I follow Coupon Queen on Twitter. I follow Coupon Queen Bee on Facebook! I liked ALEX Toys on facebook! liked The Coupon Queen Bee on Facebook. I like Coupon Queen Bee on Facebook! I like Alex Toys on FB. I like Alex Toys on facebook.